"The Royal Enfield Himalayan is priced at..." a hush envelops the venue. "... Rs 1.79 lakhs on-road Mumbai." The roar lasted well into the night. The price was good and the first reviews of the motorcycle were good too. But that was then. Now, the euphoria has ebbed just like the cool winter mornings. It's hot outside and the Royal Enfield Himalayan is about to run into some heavy weather. Because today it has company. The KTM 200 Duke makes the same peak power as the Himalayan. It is different by miles in approach and intent but the price is in the neighbourhood - Rs 1.62 lakh on-road Mumbai. We've already had people ask us to help make a decision between the Austrian Alps and the Himalayan. The Mahindra Mojo makes roughly the same peak torque as the Royal Enfield, it is billed as a tourer and it's just Rs 10,000 more expensive. What a lovely playing field. Let the games begin. The design is actually a super subjective choice here. The KTM is easily the most familiar and the most fluent design. It's sharpness and angularity is unrelenting. The light and lithe proportions are still, years later, very easy on the eye and very striking. KTMs are generally finished quite well and the build quality doesn't deteriorate significantly over time. The Mahindra Mojo is an oddball. It's come a long way from the awkward prototype it began life as but it is still far from a conventional design. Mahindra's muscular tank and overwrought bikini fairing do give it presence but beautiful the motorcycle isn't. Build quality is all right and now that a few Mojos are out there in the real world we know that the finish can be better but the build is pretty solid. The Himalayan is new to the eyes and yet it isn't. I really like the fact that it's simple in approach like Royal Enfields tend to be. But it is definitely in stance and poise, an adventure tourer. If you google images of the old BMW R 80 GS, for example, you will see the same simple arrangement of panels that lead to an honest sense of style - clearly functional. The simplicity also permits great build quality. We punished this test bike for just under 700km and we failed to generate any rattles. That's pretty solid. Finish levels can improve. The welds on the frame are the primary culprit. They're so chunky in places that even the black paint cannot hide them. And there's a lot of chassis tubes snaking about so you cannot escape it either. Clearly, the Mojo is in third with its less coherent design and finish issues. I like both the Himalayan's simplicity and the Duke's sharpness and both are well built. The KTM has the superior finish and a fluent design so the street bike takes a marginal win on this count. The range of engines, given the narrow price range, is staggering. The 200 Duke is the smallest, displacing 199.5cc. The 4-valve DOHC single pushes out a hearty 25.8PS at 10,000rpm. A thoroughly modern engine, the KTM is light on its feet, picks up revs quickly and the power spread is super linear with 19.2Nm of peak torque coming at 8,000rpm. Perspective? The Mojo's peak power is at 8,000rpm and the Royal Enfield engine does not rev to 8,000rpm. The Mojo engine is larger. 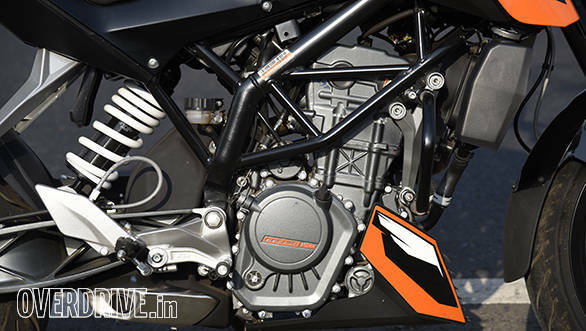 It displaces 295cc, it also has a 4-valve DOHC setup and like the KTM, it is also liquid-cooled. The bigger engine is employed in the service of torque and the output is phenomenal. The Mojo manages 30Nm - just 2Nm less than the Royal Enfield - at 5,500rpm and 27.2PS at 8,000rpm. 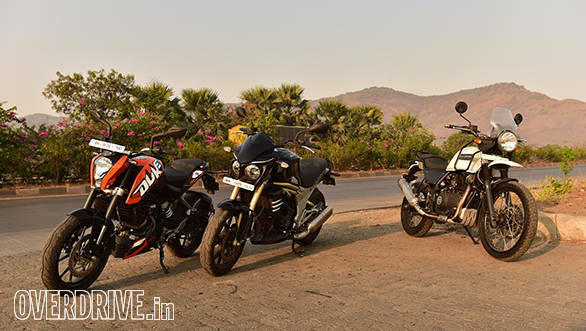 Between the two, the KTM has the performance chops but the Mojo has a terrific engine too. No comparison in the corners - the KTM is vastly better. 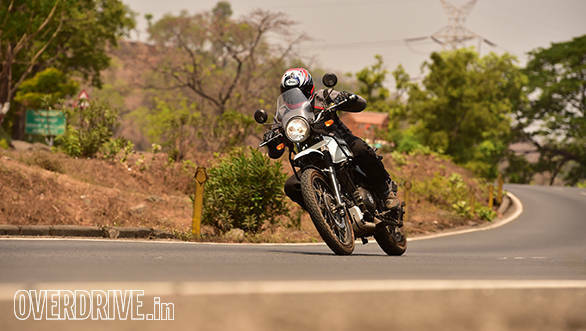 The Royal Enfield Himalayan's LS410 is the odd man out. It sports an oil-cooler, significantly lower compression (9.5:1 versus 11 and 11.3:1) and only has two valves operated by a single overhead camshaft. Its milder nature and extra displacement is underlined by its numbers. Peak power is the lowest here - 24.5PS but it arrives at 6,500rpm, the earliest. Peak torque is the highest, 32Nm and it comes between 4,000 and 4,500rpm, again, the lowest revs in this test by a hefty margin.The Duke and the Mojo manage to hit the 100kmph within fractions of each other - the Mojo is 0.03s quicker than the Duke at 8.25s. The Himalayan doesn't like sprints. 10.52s to 100kmph. Economy's similar too. All three return about 29-30kmpl and that's not going to be a factor that will win this category either. There is a substantial difference in the range though. The 10-litre KTM tank barely manages 300km while both the other bikes will run closer to 450km on substantially larger fuel tanks. Want more? The in-gear roll-ons are similar too. The KTM has the very slightest of edges at all the speed ranges we test, except in sixth where the Mojo's 2s slower from 40kmph to 100kmph. The Himalayan does not have a sixth gear. The top speeds do show the difference. 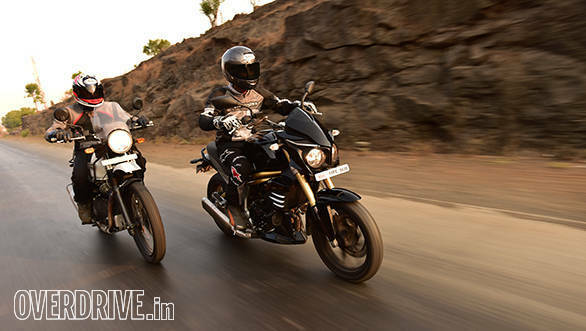 The Mojo is the fastest clocking 142kmph (Vbox) while the Duke manages 133kmph. 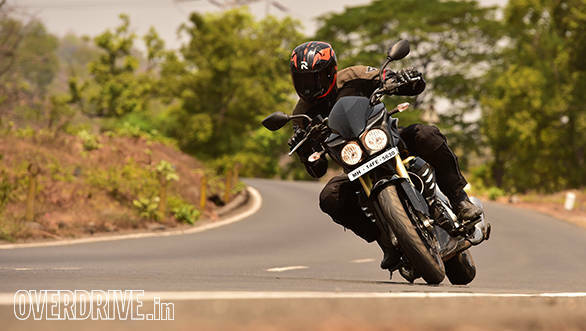 The Himalayan will hit 129kmph but far more reluctantly than both. The great equaliser is weight. The KTM is just 138kg at the kerb. Ridden back to back, the KTM feels like a featherweight commuter rather than a serious 200cc machine in this company. The Mojo feels the heaviest although it isn't. At 182kg, it's kerb weight is identical to the Himalayan. 44kg is a lot of weight to be carting around. It's sort of like having Ashok George as a constant pillion whenever you're out on the Mojo and the Himalayan and that adds up. 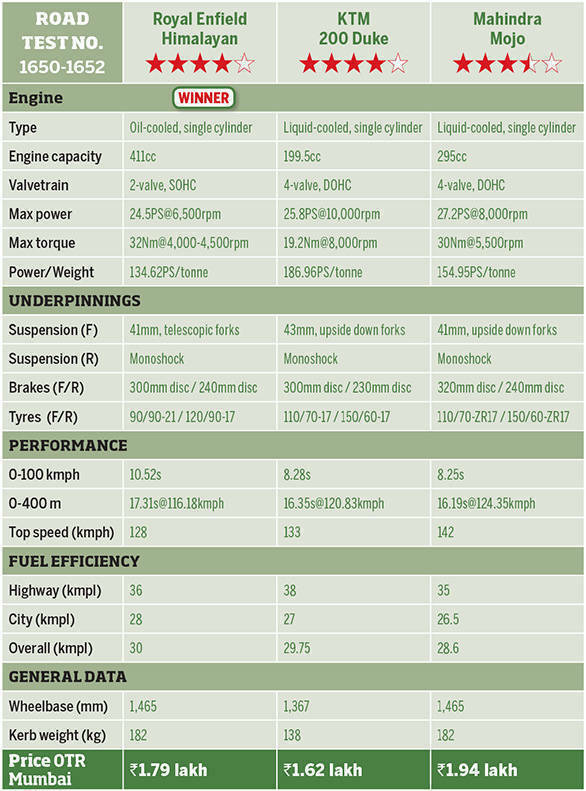 The KTM 200 Duke's engine makes 25.8PS and 19Nm, not the highest numbers of this test. But the weight - 44kg lighter than the Mojo and the Himalayan - gives it an amazing turn of speed. Thankfully the three motorcycles aren't identical in nature. The KTM, as you know, is frantic. The 200's power is seamless and it likes being thrashed. Highway rides are definitely on but you have to get used to the idea of cruising at 7,000rpm. It seems like a lot of revs but the KTM doesn't mind as long as you don't. The Mojo's engine is perhaps the most balanced engine here. It's got a smashing turn of torque in the mid-range and it can be punted along as hard as you like with no sign of mechanical strain. You can cruise as fast as 100-115kmph if you put your mind to it and the motorcycle simply takes no notice. Lovely. And frankly, the Mojo's engine is its best, most well-developed bit. 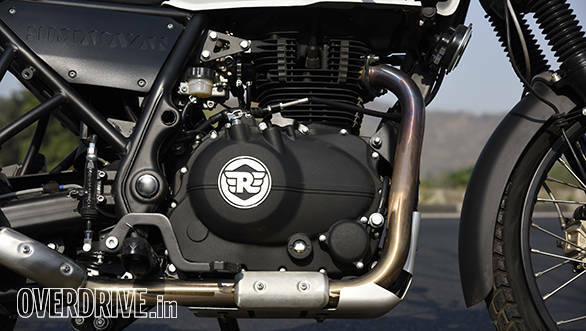 The Himalayan's engine is much more mild in nature and tune. It hates being hustled. Hard acceleration brings vibration and harsh noises and you'll quickly settle into a quiet, smooth lope. Yes, smooth. The counterbalancer really does work on the LS410 and as long as you stick below 5,500rpm, there is no vibration. The Himalayan's torque and gearing permit a super sweet cruise to 95kmph (just under 5,000rpm in 5th) and you can extend that to 105kmph (5,200 in 5th) if you'll live with some footpeg vibes. At these speeds overtaking is possible but it disturbs the peace until you settle back in to the groove. The three motorcycles produce remarkably similar performance metrics but they're worlds apart in feel. 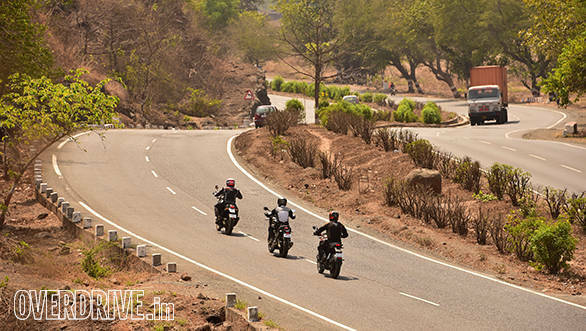 The Mojo and the Himalayan genuinely make for better highway machines but the Mahindra is the better engine of the two. What the Himalayan misses, really, is a sense of mechanical cohesion outside of its modest sweet spot, especially when you're trying to extract acceleration from it. I cannot imagine why a modern 411cc engine should struggle at these speeds. Thank god the KTM 390 Duke isn't here, for instance, it would eat it alive! Winner? The Mojo's engine is the best balance if the highway cycle is factored in. In the city, the KTM is supreme. The Himalayan isn't third as much as it different from these two. It would rather peacefully and swiftly waft about. But it simply isn't as good as either of the other two. Not in spec and, sadly, certainly not in performance. Thankfully, the chassis design and behaviour isn't so closely matched. The Mojo has the odd frame here, supported very ably by some very fancy equipment. It does make the Mojo frame competent enough but it isn't as good as either of the other two. More importantly, as I never tire of saying, the Mahindra feels so different that I suggest a long test ride before you make up your mind - it won't suit every one. 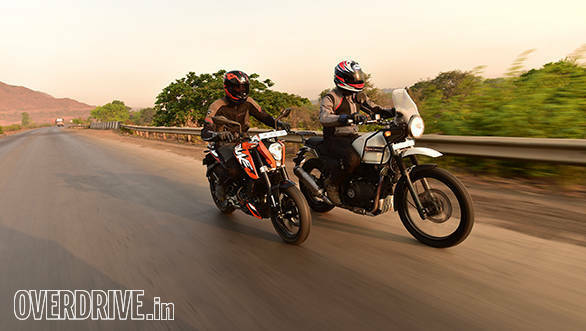 The fight between the KTM and the Royal Enfield is a good, hard one. The KTM's road manners are superb. The MRFs are excellent tyres and the suspension setup is stiff. It works really well as soon as you figure out that it likes you to slow before bumps and then gas it across. 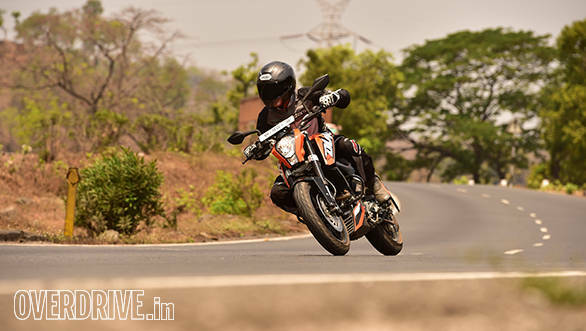 The KTM trellis feels ultra-stiff and this makes for a responsive, direct handling experience with corners handled with terrific enthusiasm, confidence and panache. The Himalayan couldn't be more different. The KTM is packed with fancy bits like the upside down forks and the Royal Enfield sticks to its simple guns are better philosophy. Luckily, the chassis knows where to point the guns and when to shoot. Ride quality is superb. Superb without context or reference. 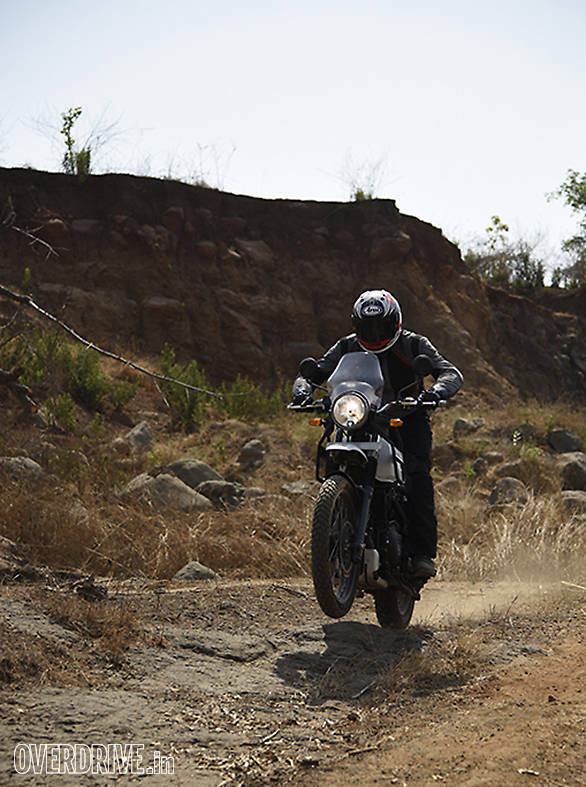 The Himalayan has yards and yards of suspension travel available and it makes the most of it. Sit like a potato in the saddle and it lets very little disturb you. Stand up and attack bad roads and the Himalayan is breathtakingly capable. The KTM is too, mind you, but it needs much more skill, attention and commitment to pilot. The Royal Enfield is, comparatively, a warm hug from a grandparent. It takes the sting out of the roads and soothes your nerves into believing that everything will be okay. This is a superb quality because it makes all roads simpler to negotiate. I imagine that descending off a high pass in the middle of a snowstorm is a time when a friendly motocycle like the Royal Enfield will perhaps be more useful than a frantic little number like the KTM. In fact, the first ride was extensively through treacherous conditions in Kashmir and while the motorcycle shone in those trying conditions, RE's new Rev'It Darcha jackets and pants kept us warm. The best part, unlike the Royal Enfields of yore, is that it feels indestructible, unflappable and like it was built for the hard life. On the brakes, the KTM has it. The new 2016 models have terrific brakes and they're hard to fault. The Himalayan has a much softer setup that requires time to accept and then use. On the road, the Ceat Gripp XLs also lack the outright grip of the MRFs. The soft initial bite backed up by force from a lot of lever effort isn't a mistake though. It allows you to work the brakes in iffy traction which would be way harder otherwise. Something the KTM accomplishes with a lot more feel. None offer ABS even as an option and that's just shameful on the part of all three manufacturers. Winner? Hard call. If you're going to be on the road a lot, the KTM makes a great case for itself, especially if you're an urbanscrape strafer.But if you're venturing farther, think about the Royal Enfield - the only question really is the LS410's reliability, currently an unknown. Tough test, no? Let's start with the Mojo. The Mahindra is the most expensive at Rs 1.94 lakh on-road Mumbai. It's got the most balanced engine here and it's a competent, if odd-feeling chassis. Should you get one? Try one and see if you like the flavour. If you do, go ahead. 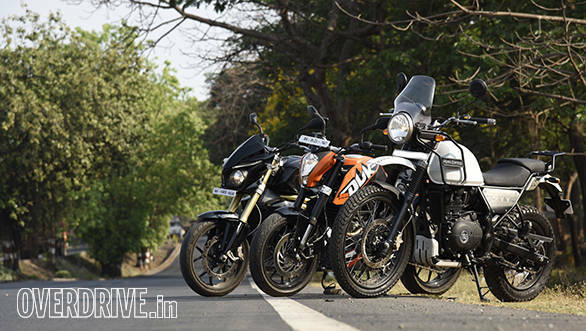 Between the KTM and the Royal Enfield, it is a harder call. Both commute exceedingly well but differently. Both will run the highway at similar speeds, also differently in nature. Both also manage off-roading but the Himalayan is clearly vastly superior at it. The KTM is the cheapest motorcycle by about Rs 15,000. It's one of the very best street bikes you can buy. I have toured on it so I know its biggest constraint is not its revvy, frantic engine but space. It's a small, cramped motorcycle and that's hard work. The Royal Enfield, surprise, comes across as the best balance of attributes in this class. I mentioned the lack of power as an issue in the first ride as well as the test and it's a real thing. I'm very upset that the LS410 isn't a stronger, more powerful, more authoritative engine. I believe the fact that the Royal Enfield Himalayan wins requires clarification. It isn't the best motorcycle here when you consider them from the perspective of their roles. 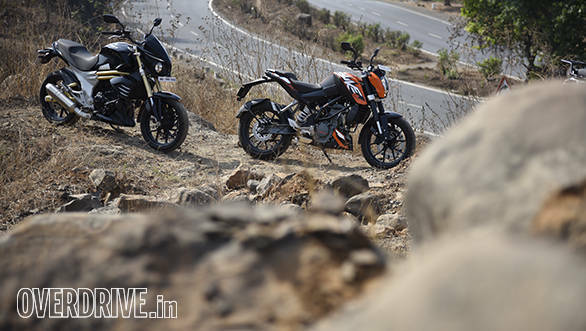 The KTM 200 Duke is a far superior street bike than the Himalayan is an adventure tourer. However, here's the thing. The Himalayan finally sets the ball rolling for people in this price brand who've wanted to take their motorcycles and go far. Down the highway and off of it. They have never had an option and the Himalayan is the first time a manufacturer has answered their call. The Himalayan isn't perfect but it is the best compromise for more people. 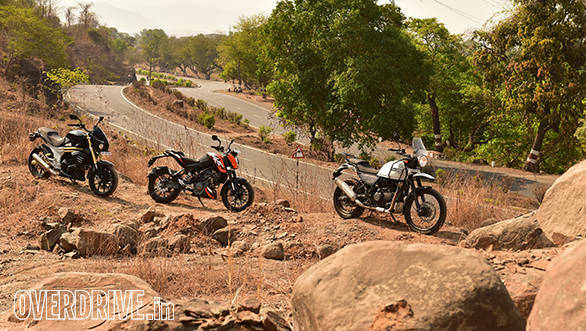 More people will be able to do more with the Royal Enfield Himalayan than either of the two other bikes here. And that's why it wins. Narrowly, but it is the winner. The Himalayan does have more questions to answer, of course. There is the matter of the long term reliability of the motorcycle. All-new motorcycles have to pass this test and I think the bike is fundamentally good but time will really tell. The other thing about the motorcycle is the level of performance. It stops the Himalayan from being a motorcycle that I would happily recommend to one and all. A motorcycle I would buy and a motorcycle that performance freaks, highway guys, mountain goats and everyone else could fall in love with. 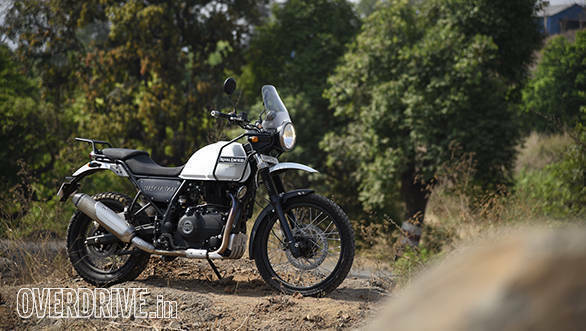 Royal Enfield believes the Himalayan could be your only bike. With more power, it could have been, it really could have been. For now, it's a good one but it's short being a great one.